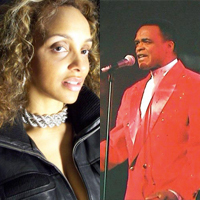 Father/Daughter Duo ERNEST WRIGHT & NICOLE WRIGHT perform classic hits. ERNEST WRIGHT is a founding member of Rock and Roll Royalty and Hall of Fame Inductees “Little Anthony and the Imperials.” In 1958, the Imperials had their first hit and one of the biggest records of that year, “Tears On My Pillow,” followed by another highlight of Ernest’s career when he wrote the hit record, “Two Kinds of People In The World.” Throughout the 50‘s, 60‘s and ’70’s, The Imperials scored many other great hits including “I’m On the Outside Looking In,” “Goin’ Out of My Head,” “Hurt So Bad,” “Take Me Back,” and “Shimmy, Shimmy Ko-Ko Bop. NICOLE WRIGHT is a multilingual (English/French/Spanish) singer, songwriter, poet and music producer who has performed throughout the world. She is a native New Yorker and international artist who performs solo, in a duo with her father, and as a band leader. Nicole is currently in the studio working on a follow up to her self-produced debut album “Fire”.